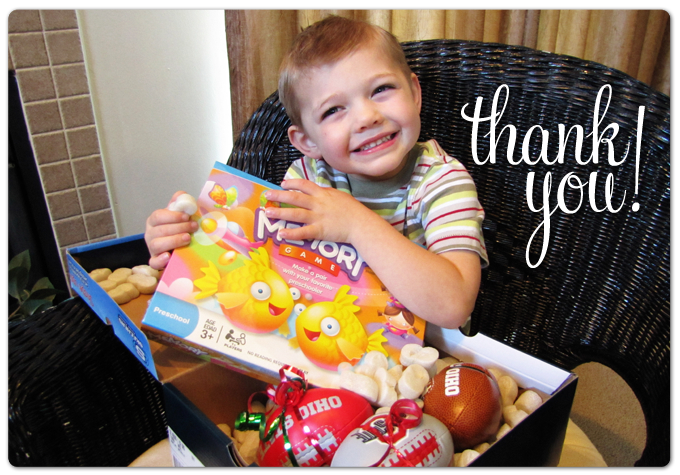 Yesterday a package arrived on our doorstep for Bryson from Mommy Kim's parents, Mike & Marcia! He was so excited. I told him to wait to open it until I could run upstairs and grab my video camera because I really wanted to video tape his reaction as he opened it. When I came back down with my camera I got him situated in a chair, turned on the camera, and started recording (at least I thought I did). As I recorded, I kept grinning because he was so darn excited and said the cutest things as he opened it. I kept thinking to myself, "this is going to make the cutest video." After he finished opening the gift, which he LOVES and hasn't stopped playing with since, I went to play back the video and realized I had somehow forgotten to push the darn record button, so I missed the entire thing! I was SO mad. But I did get a little clip of him after he opened it that you can watch below (it's not even an ounce as cute as the original video would have been....but it's the best I could do). Anyway, thank you so much Mike & Marcia for thinking of Bryson and sending him that gift. We certainly never expect anything but are always so appreciative when you send things to him. I just have to tell you he LOVES those footballs. We played a game this afternoon where we were throwing them at each other and for some reason he said we had to say the word "submarine" each time we hit each other with the football (I have no idea where he got that). So we ran around the house yelling "submarine!" each time we nailed each other with each of the balls. It was a blast! We'll have to post a picture soon of him in all of the Ohio State gear you've sent him. He's going to be the best dressed Ohio State fan around!